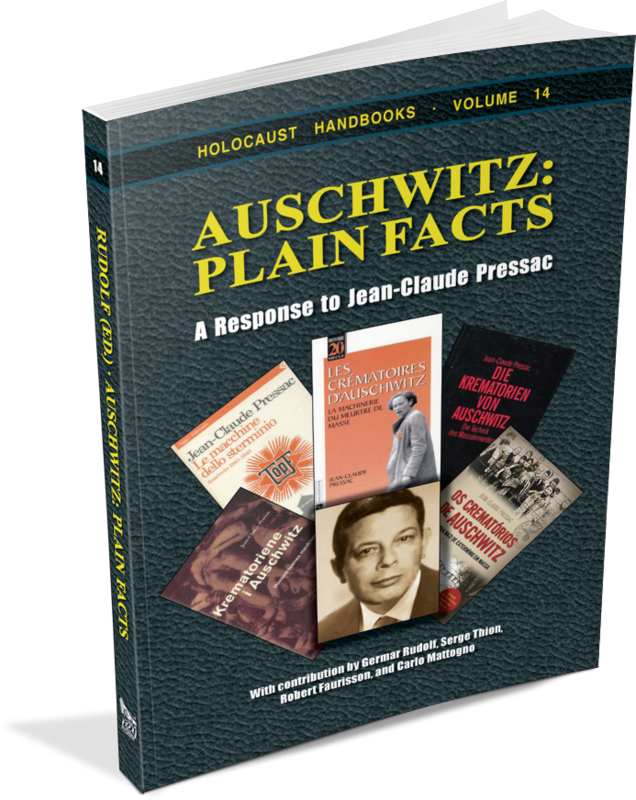 In Auschwitz: Plain Facts, Pressac's works are subject to a detailed and devastating critique by leading revisionist scholars. Although Pressac deserves credit for having made accessible many hitherto unknown documents, his writings could not refute the revisionists, because Pressac violated many scientific principles: Neither did Pressac adhered to scientific nor to formal standards when interpreting documents. He made claims that he either could not prove or which contradict the facts. Many documents he quoted do not state what he claimed they do. nor are there any technical consideration in them. In fact, he reveals such a massive technical incompetence that his works belong into the category of fiction rather than factual history. Despite these deficiencies, Pressac is still hailed as the savior of the Auschwitz-Holocaust by the mainstream. 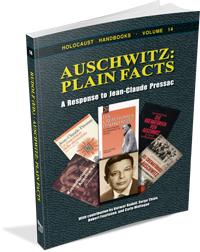 Auschwitz: Plain Facts is a must read for all those who want to argue against the lies and half truth of established historiography. With contribution by Germar Rudolf, Serge Thion, Robert Faurisson, and Carlo Mattogno. Second, revised edition with a new preface. 2nd, slightly revised edition, 226 pages. Format: pb, 6"×9", 17 illustrations, bibliography, index, glossary.